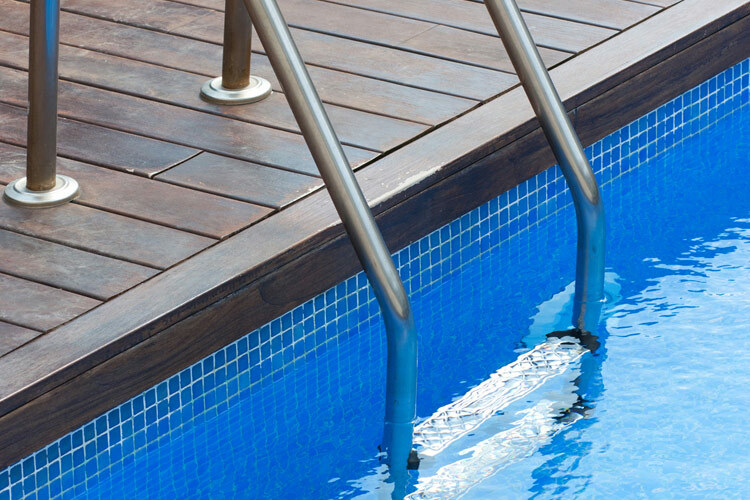 The choice of finishes is fundamental for a successful project and should be approached with the same care devoted to functional and structural aspects. 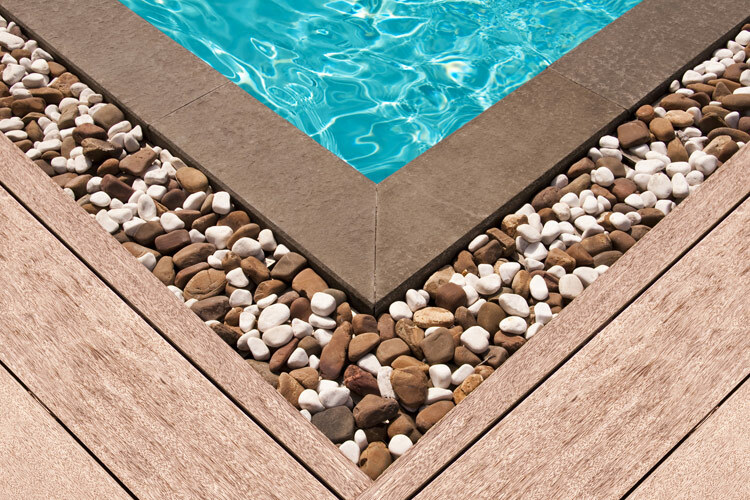 These details will define the style of your pool and ensure it enhances the surrounding natural and architectural setting. 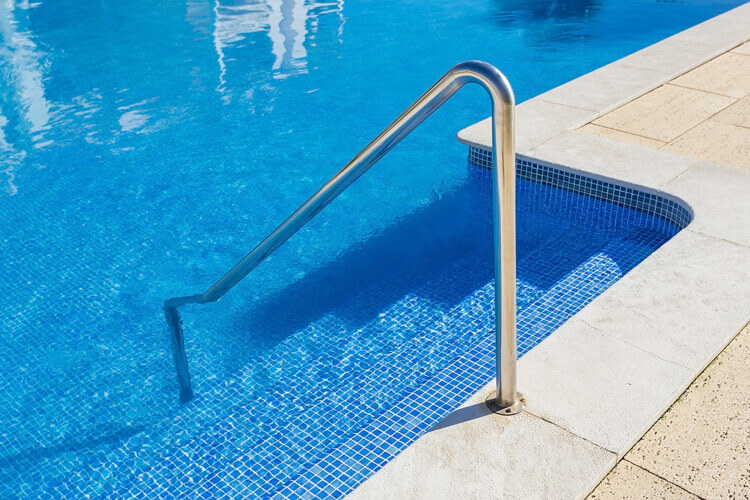 Our experts will help you choose the key elements for the pool's aesthetic effect and enjoyment: pool liner, deck floor, pool steps, accessories (showers, slides, diving boards), pool deck furniture. 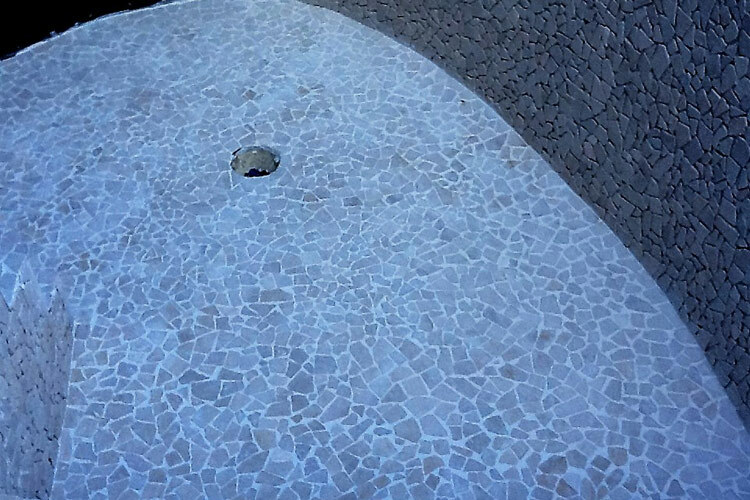 We will show you samples of the materials on offer, to enable you to assess not only their visual effect, but also their physical feel and positive energy: the solidity of ceramics, transparency of glass, classic stylishness of mosaics, the warmth of natural stone. 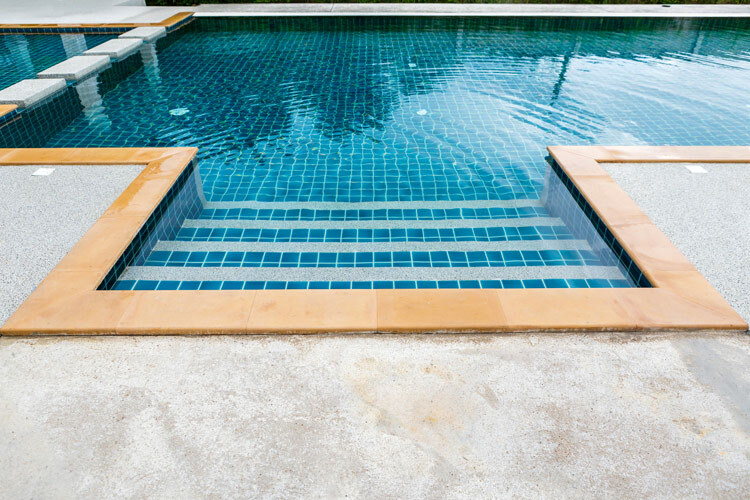 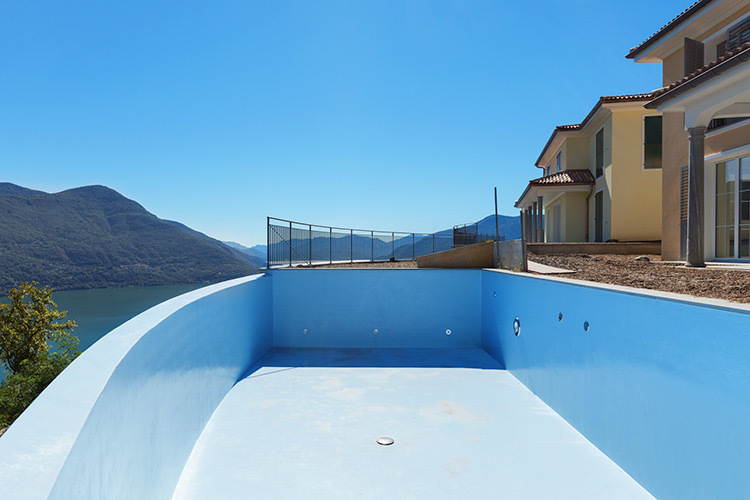 The pool's liner determines the aesthetic character and colour of the pool as well as providing an insulating layer between the water and the pool's shell. 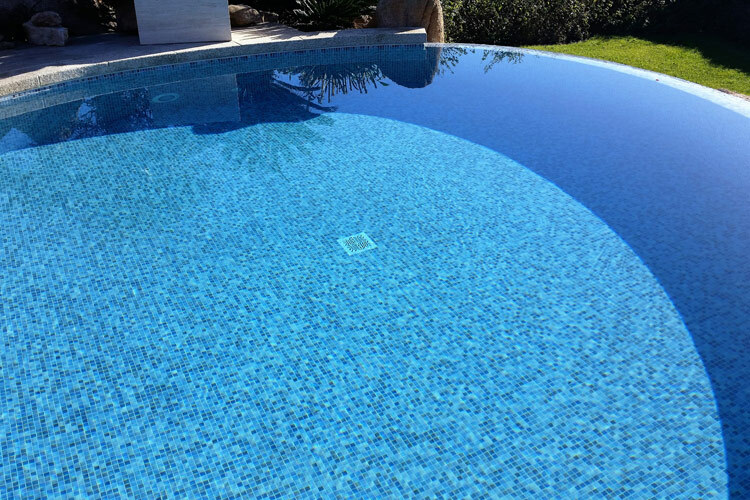 Liners are available in various materials and colours, offering many solutions for customising your pool. 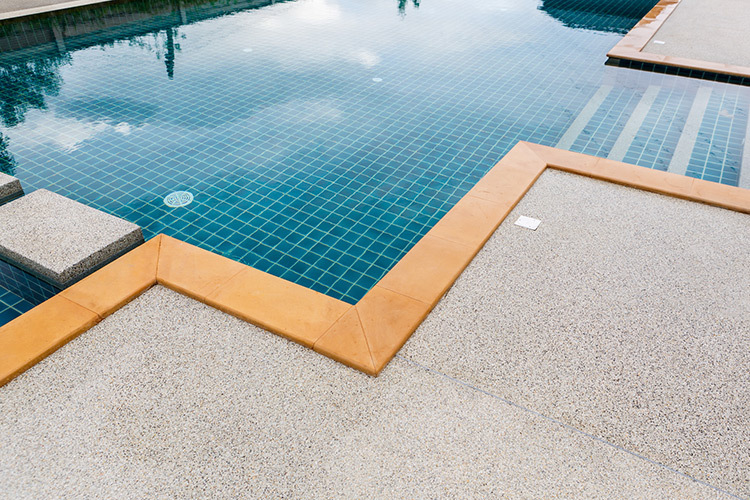 Increasingly widely used, prefabricated PVC liner and reinforced PVC liner provide high workability and weldability, and are resistant to UV rays, the weather and water treatment chemicals. 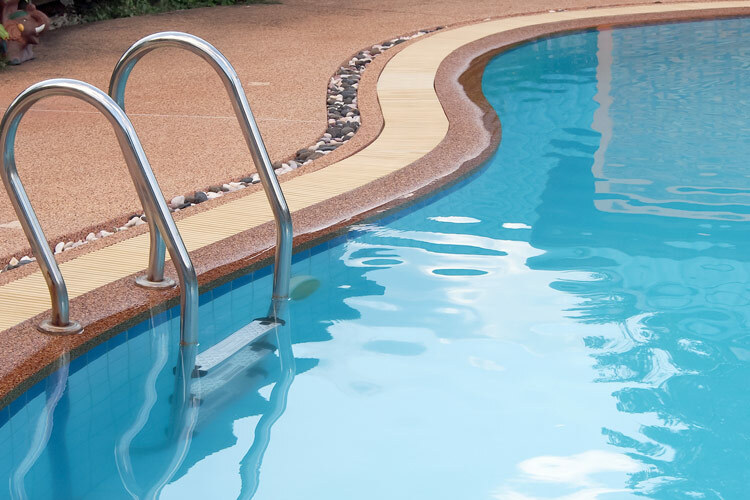 Prefabricated PVC liner is a smooth, non-slippery lining, adaptable to various pool shapes. 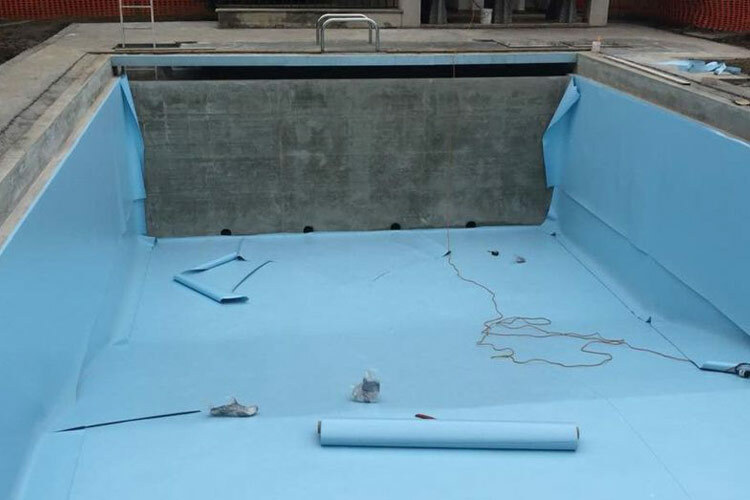 Reinforced PVC liner is a plastic membrane reinforced with a mesh, which is laid and glued on site, guaranteeing full waterproofing. 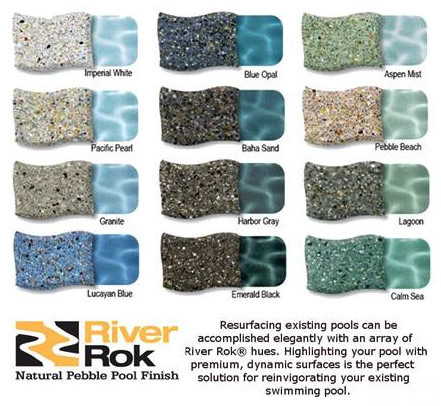 You can choose between various colours and tones: among the most popular ones are: white, blue, light blue, sand, grey or black. 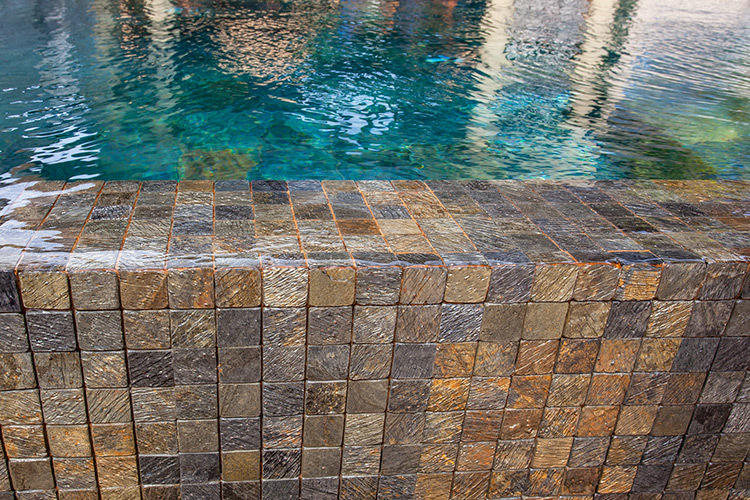 Stylish and elegant, mosaic tiles are traditionally the material of choice for surfacing luxury pools. 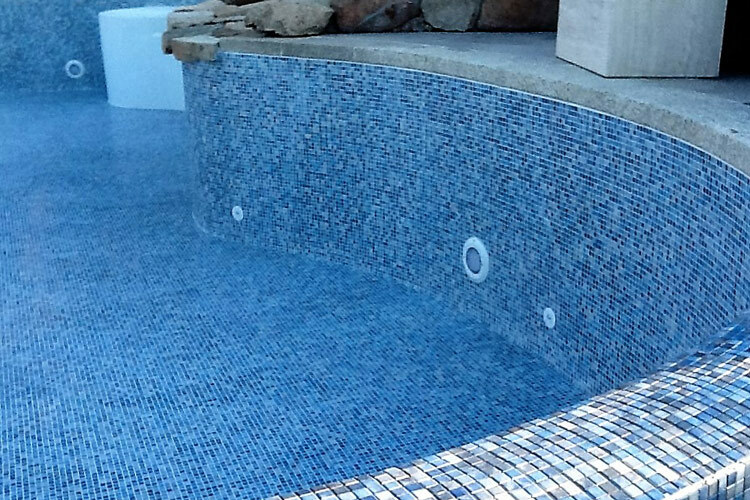 Mosaic liners come in a range of designs and colours and vary as to style, material and price range. 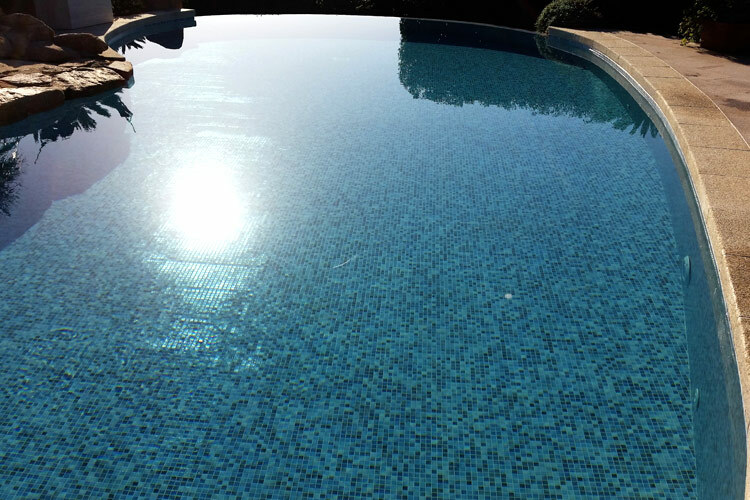 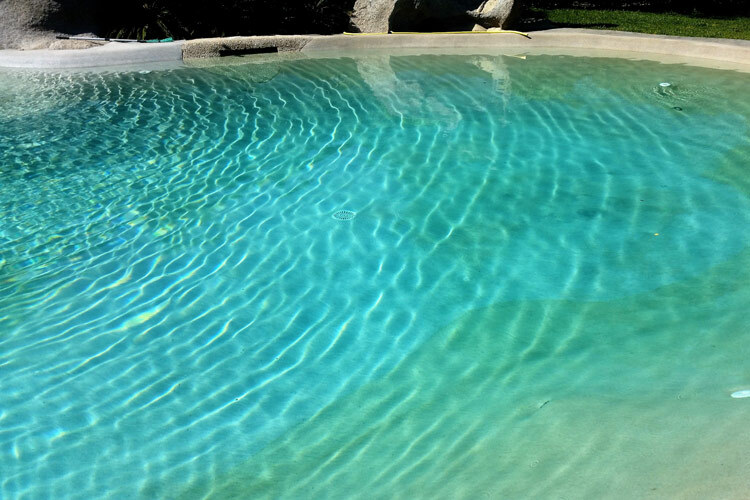 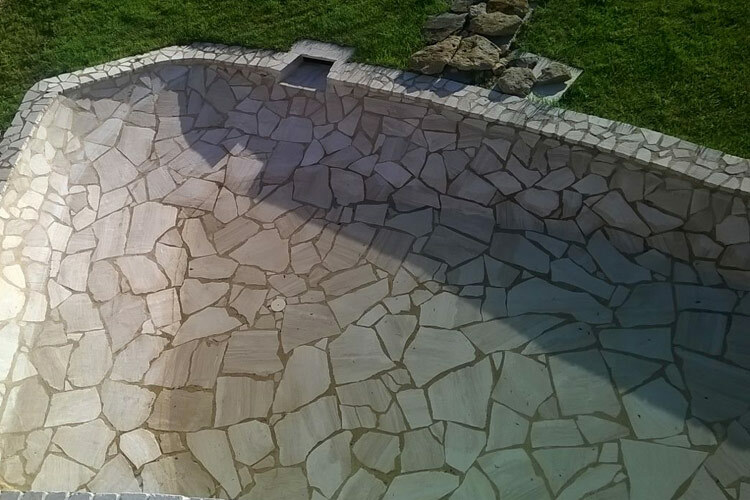 Undoubtedly, this is the most traditional pool surfacing solution, long-lasting and simple to clean and maintain. 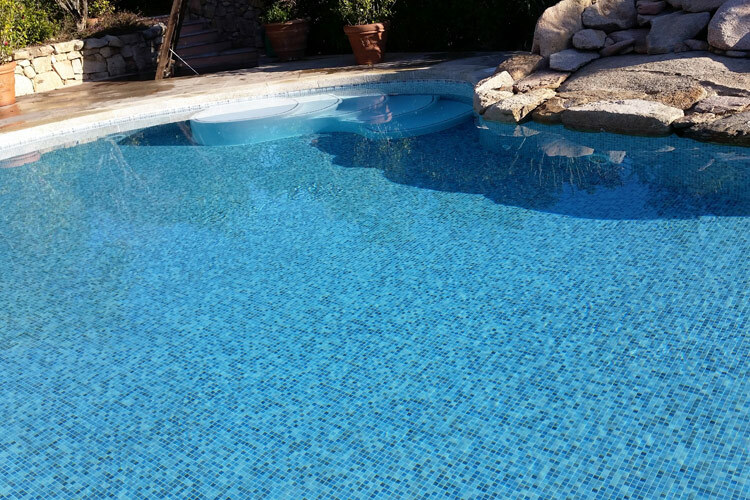 A stylish alternative to classic ceramic tiles, glass mosaic is extremely appealing, matching the crystal-clear purity of the water. 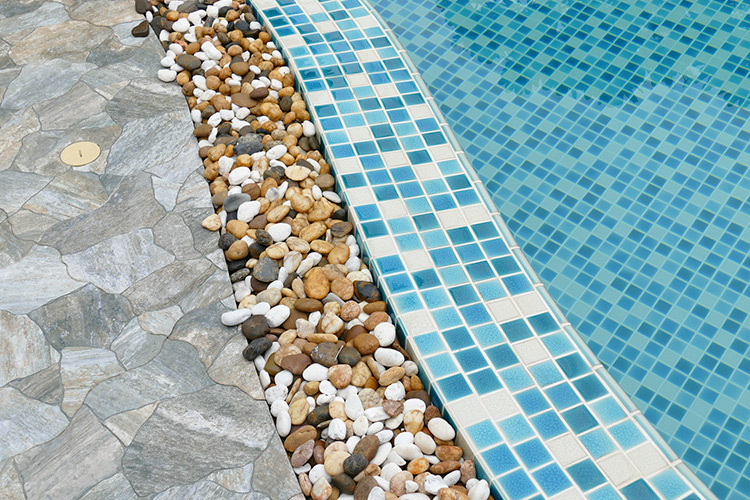 The wide choice of colours and styles makes it possible to customise the pool's décor to taste. 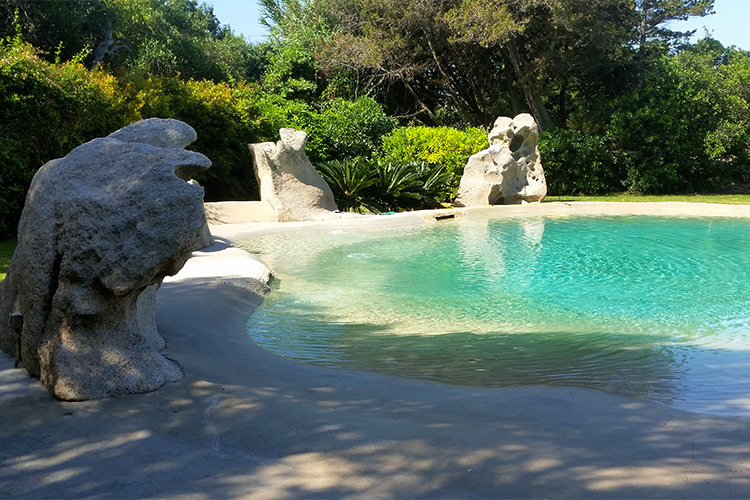 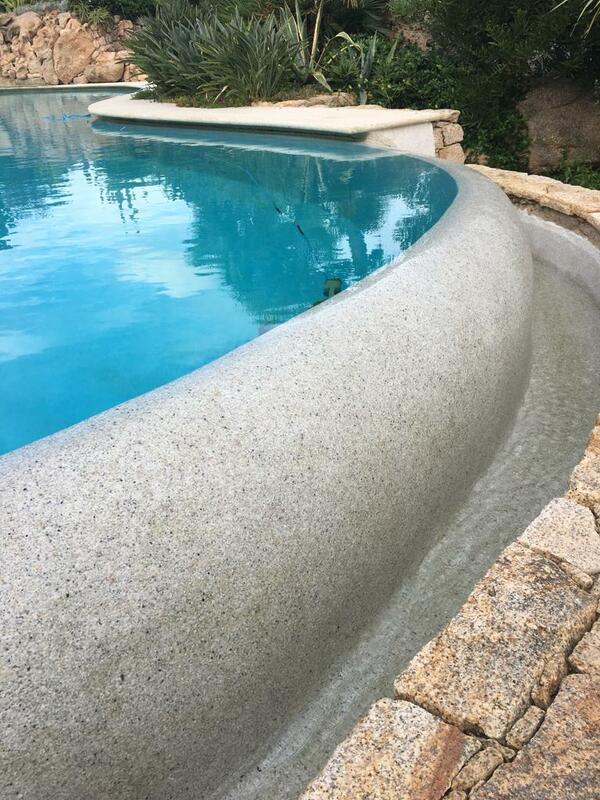 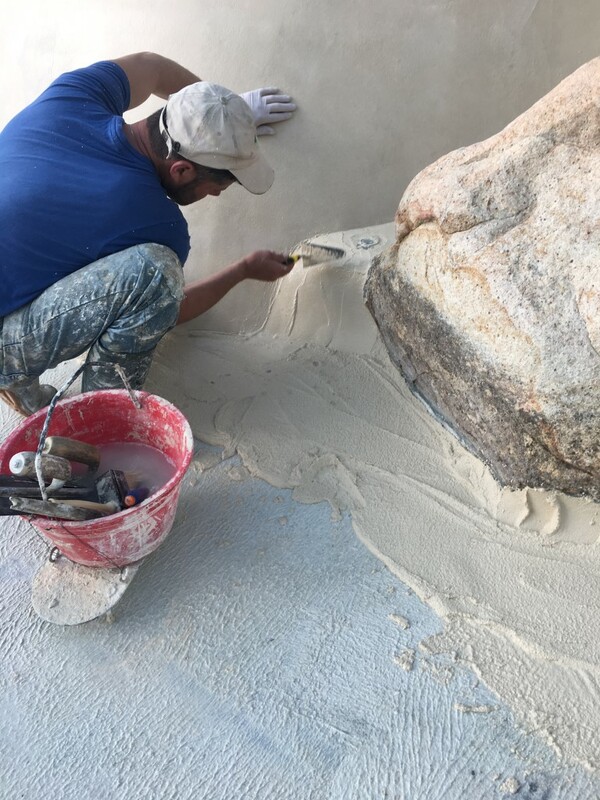 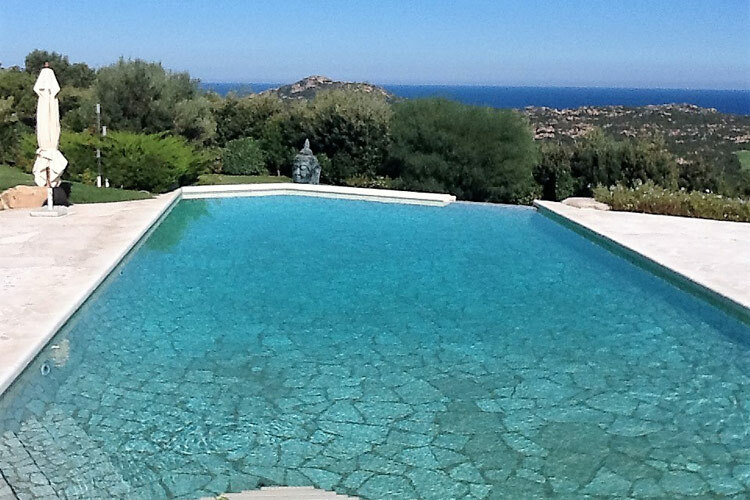 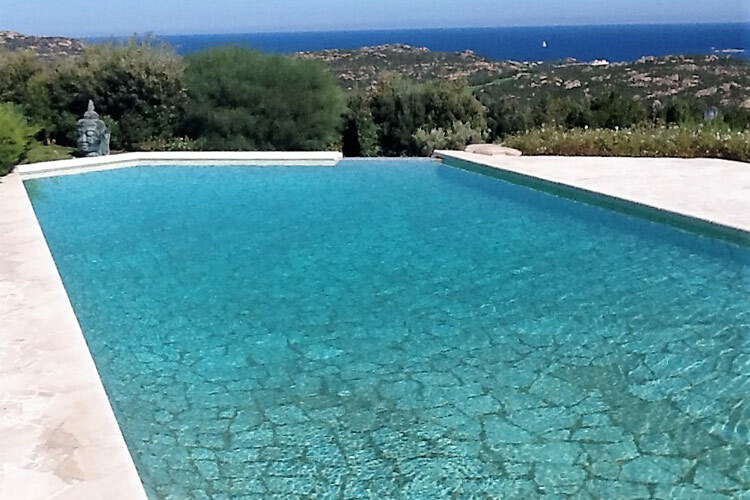 An exclusive, high-cost solution harmonising the pool with the surrounding environment: the plaster and resin mix guarantees excellent waterproofing, and the stone fragments added to the mix create a stylish natural effect. 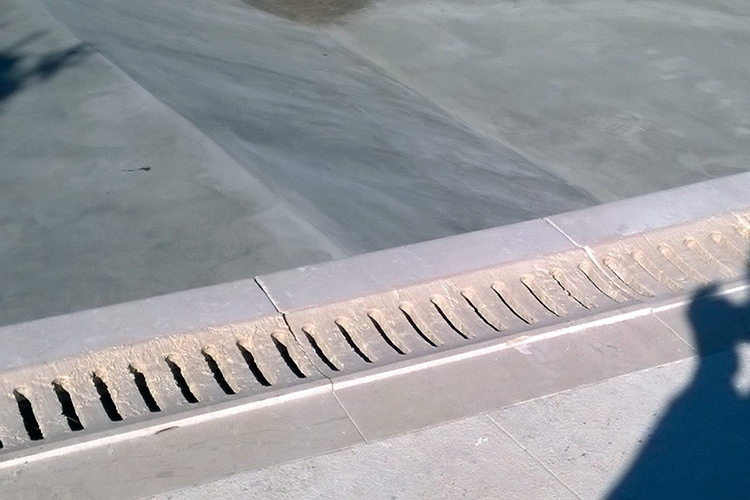 This is a traditional and very stylish solution. 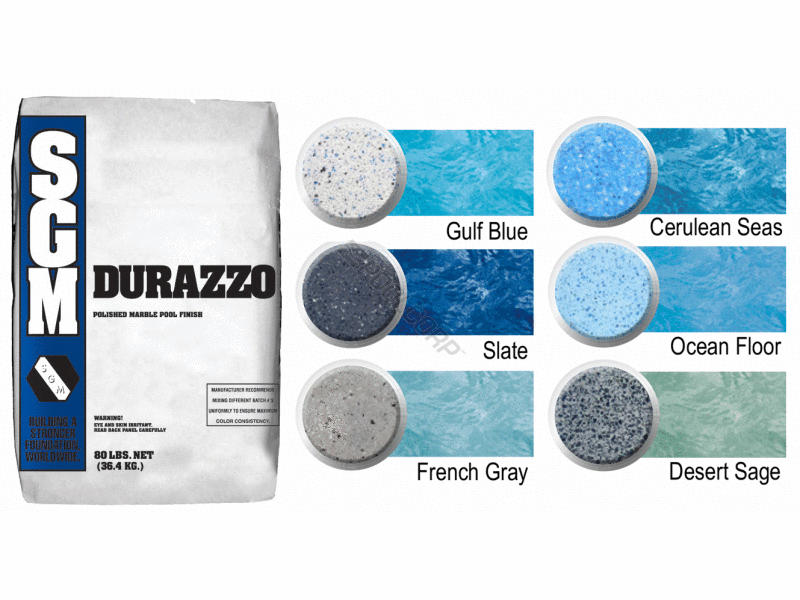 Ceramic offers a wide range of colours, textures and sizes. 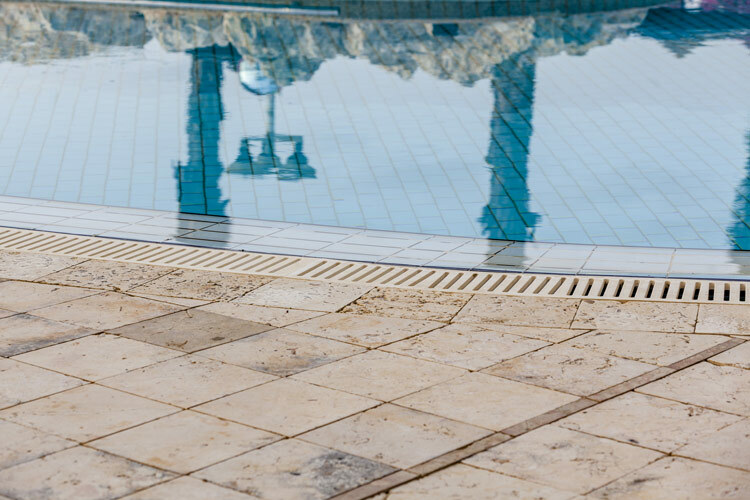 The most frequently used materials thanks to their strength and durability are ceramic klinker tiles and gres porcelain tiles. 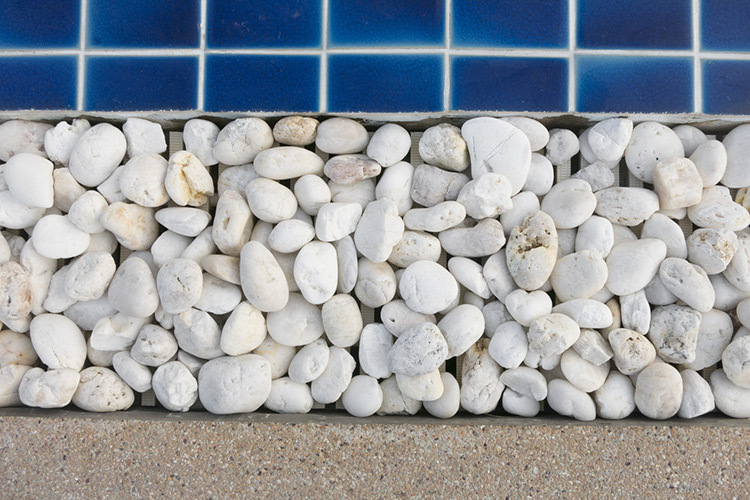 White polished pebbles are often used to cover the lower-level grid in deck-level pools. 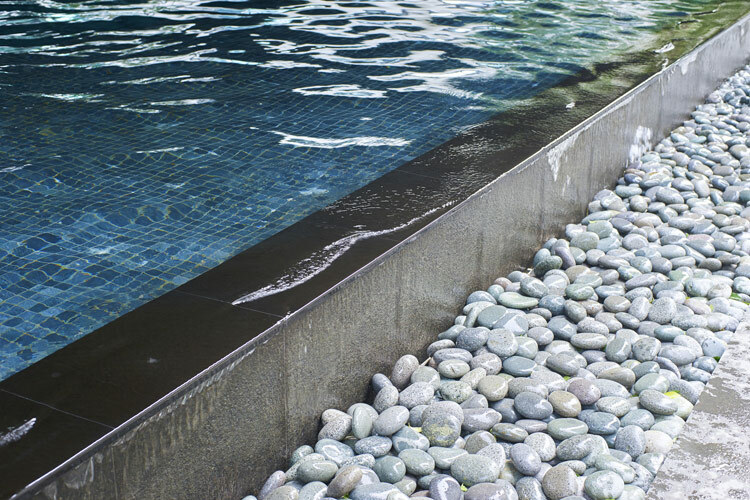 Set along the edge of the pool, these pebbles give a sensation of naturalness to the pool and are comfortable to walk on. 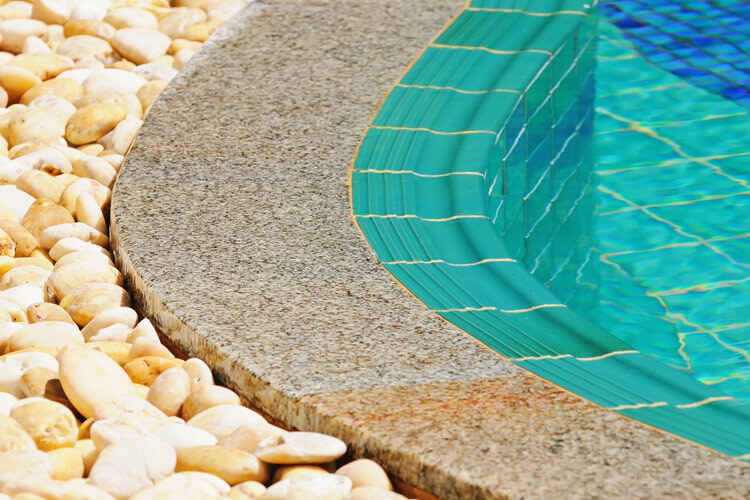 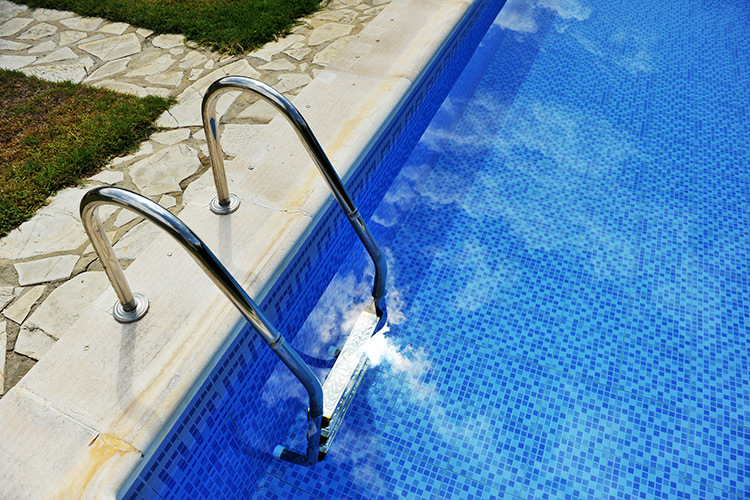 Natural stone can be used both in the upper portion of the pool and for its perimeter. 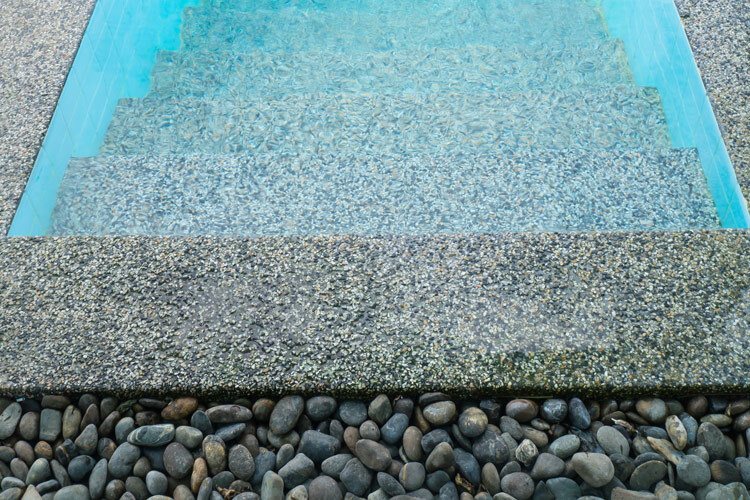 Local stone is often preferred, but there is a wide choice of materials to match the perimeter tiling with the pool's colour and integrate the pool perfectly into its natural environment. 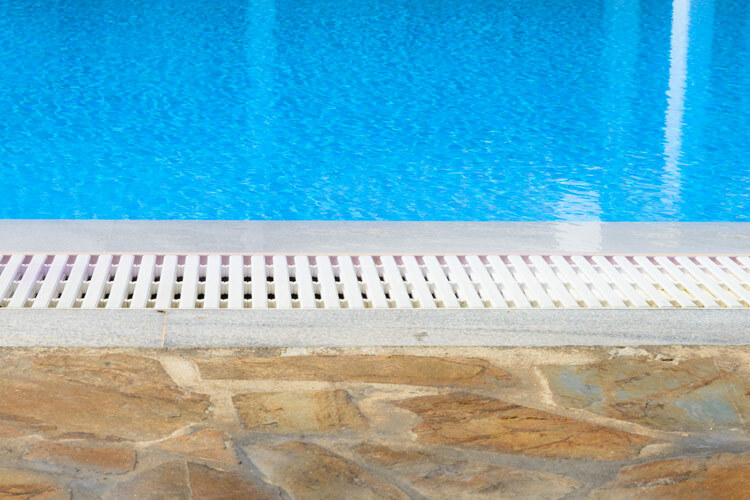 Stone overflow grating gives the pool a uniform and stylish design and provides a number of functional benefits: stone allows perfect water drainage; it is non-slip and resistant to discolouration, frost, UV rays and chlorine.